This page is a compilation of excerpts from the book Camp Wannakumbac, The Dream & The Development published in 1988 for the 40th anniversary. 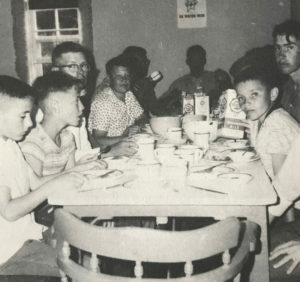 The camp, for many years now called Wannakumbac, may first have opened its doors to campers in the summer of 1948, but its history stretches even further in the past. It was while war clouds gathered for a second world conflict that Manitoba farm organization moved into its ‘Federation’ era. During the 20s United Farmers had proved itself a powerful and effective organization – even establishing a political wing which in a proud moment of its history formed the government of Manitoba – a success which its counterparts had repeated in Alberta and Ontario. But political power was waning and there was a restlessness which foreboded organizational change. From the ashes of the once history-making U.F.M. arose the Manitoba Federation of Agriculture (M.F.A.). But the war clouds finally burst into a storm, and with the call for volunteers came also a focusing with clearer eyes on the potential within youthful energy and ability and idealism. If young people were to bear burdens of responsibility and defence for a country… if they were having placed in their hands the weapons of war and destruction, then surely there must be preparations to replace those weapons with some of the tools for peace and prosperity. 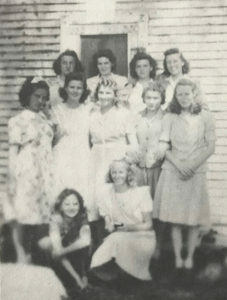 As farm organization moved into the 40’s, youth programming began in earnest. The M.F.A. announced the appointment of a first Youth Director, Helen Watson. Helen had grown up on a farm, had early been exposed to the co-operative philosophy, and had been active in church Young People Societies. A natural bent for leadership well equipped her to move into a spot where no past parameters restricted the imagination, and there the folk school idea was developed. Over the next 13 years it was maintained and flourished. Folk schools had become synonymous with farm organization in the province. Folk schools were co-educational and were conducted during the winter months, their period of tenure approximating the time between the end of harvest and preparation for spring seeding. For seven days, a ‘folk school’ group met in a community hall to study, discuss, eat, play, sing, and share duties with one another. The experience became a turning point in the lives of many of those who attended. Discussion groups provided ideas, information, and challenge. Training and experience in public speaking and in group leadership offered tools which could be put to good use in home communities. But above all, there abounded a sense of joyous camaraderie. A tantalizing vision of an attainable and just society. M.F.A Youth Camp held at Madge Lake. If one concentrates on youth reports and recommendations through Federation minute books from 1943 to 1950, there is one recurring theme. The call for an establishment of a permanent site where youth work would become a continuous program. 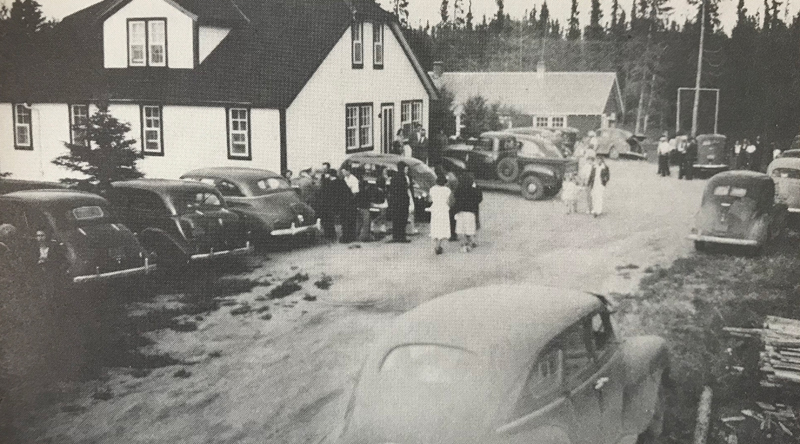 Sites for a permanent folk school were investigated at Carman, Dauphin, and Portage la Prairie where government buildings were on the market due to discontinued special social programs, or because the end of the war brought disposal of assets. While a permanent folk school might operate very efficiently in or near a business and transportation centre, a permanent camp required a considerably different milieu. A chief requirement for a camp would be a waterfront. M.F.A. Youth Camp held at Birtle Park. Since the first experiment in 1942, Federation camps had penned a volume of experience. They had proven the worth of summer programming. They had become the fountainhead of a determination and of a dream. Most available lakefront sites had been tested with varying degrees of satisfaction. It was Ben Lewis, then executive-secretary of the Federation, who launched the proposal. 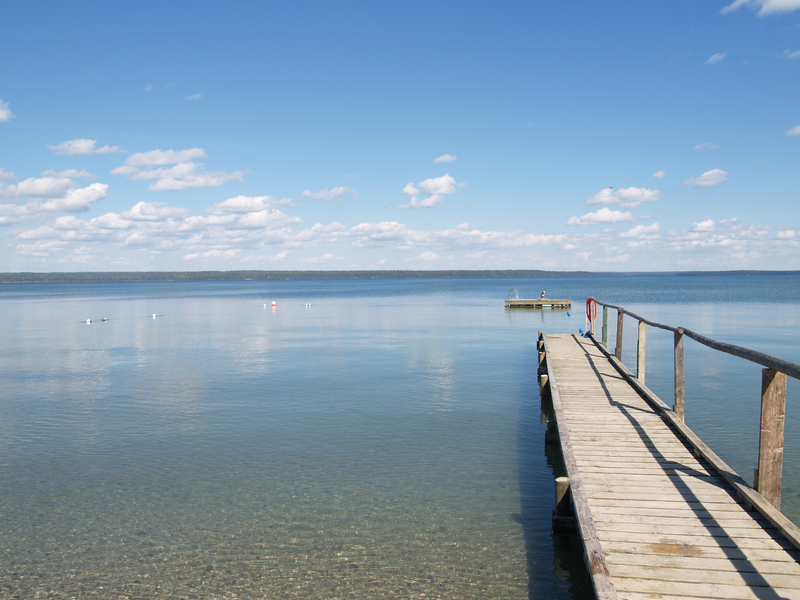 The federal government should be approached about procuring property on Clear Lake in Riding Mountain National Park. Federation officers signed an agreement with the government in Ottawa. Outright purchase of property in a national park was not possible. The document signed by the Federation was a 99 year lease of a site on the north shore of Clear Lake. It was a marshy-looking area. Clearing, levelling, filling, planting, and water-reed removal would all be required. But enthusiasm ran high. During the summer several pilgrimages to the spot were made by interested persons and groups. A committee was set up and individuals were delegated to explore what initial work would be required. Due to the steel strike the committee was unable to procure a bulldozer for the work. Still it was felt that the land should be cleared before winter set in as an incentive to those raising funds and doing publicity. Then rumour whispered along the headlands of the province and was caught by the sharp ear of the chairman of the camp committee. A store and post office which had been operating for a number of years in the Crawford Park area – on the western boundary of the park but outside its jurisdiction – was about to be abandoned, and property with buildings was to be up for sale. Investigation was initiated. Camp chair and cohorts paid a visit and fine-combed the potential. Federation president and director of youth work did a further survey. 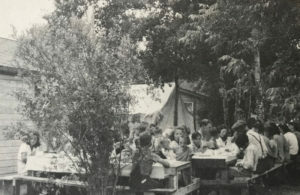 With bits of ‘basic’ remodelling it could be possible to conduct a full program of camps during the coming summer – 1948. That’s if a deal could be made. The ‘bulls and bears’ of the real estate market were moving in appropriate cycles for a quick decision by the Federation. For the sum of $6,000 a four acre site and all buildings thereon became the property of the Manitoba Federation of Agriculture and Co-operation (M.F.A.C.). It had happened. A permanent camp site for Wannakumbac had become a reality. Prior to its sale to the Federation, this site had been operated as a post office since 1924, a telephone pay station was added in 1928, and a sawmill in 1929. In 1934, a brand new building would replace the old log structures and operate as a General Store for the next 12 years, serving the settlers moving into the area. 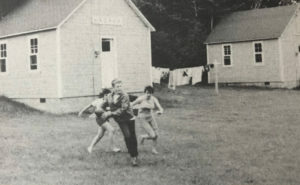 This General Store would eventually house the very first staff and campers at Wannakumbac in 1948. A hop-step-and-jump east of the main building stood a long shed with a separate ‘apartment’ at the south end. For a number of years this structure was to provide dormitories for the boys and young men. Power was not yet available as the Manitoba Government had not yet completed its ‘rural electrification’ program. A gas driven generator was purchased to provide some lighting for the first camps. That same summer a well was dug on the north side of the property and set water flowing with a hand pump. The water was clear and pure and served the needs of the camp till waterworks were installed many years later. In 1948 toilet facilities were of the ‘outdoor biffy’ variety. As for bathing – the lake was but a few steps away! Tables and chairs purchased from war surplus. There was still a whole camp to furnish and precious little time. The youth director was shipped off to investigate war surplus supplies and, if budget permitted, to purchase basic necessities. Wheeling and dealing led to the presentation of a lengthy list of proposed items for the board’s approval. Among those items: some 25 metal bunk bed frames and springs; a number of single beds; mattresses; long folding tables; benches and chairs; dozens of plates; cups, bowls and cutlery pieces; serving dishes; pots, pans and pails; and a variety of household and outdoor tools. The purchases were finalized. Arrangements for shipping and trucking to the site were concluded. Then it was off to the wholesalers to arrange for bulk foods – cereals, flour, sugar, macaroni, rice, canned goods, pickles and other non-perishables. Three camps were conducted in that first summer on the permanent site – one week each for juveniles, juniors, and youth. Slowly there had come an acceptance that more staff was essential to a well-run and adequately-programmed camp. Nine were on the staff roster – director, assistant director, secretary, program assistant, sports director, ‘Mother-cook’, two lifeguards, and caretaker. 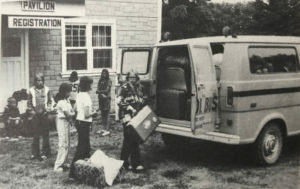 Camp girls were packed into the bedrooms and large upper hall of the main building. Boys were bedded down (optimistically speaking) in the long shed, with male staff occupying the adjoining room. Female staff lined up in the long verandah. The width allowed only a narrow corridor between the ends of the beds and the outer wall. Dishes purchased from war surplus. In August 1948, it was called Visitors’ Day. The Federation decided it was an opportune time to open the new site to all interested persons. An invitation to ‘open house’ was issued and a program planned. It was a one-day affair of getting acquainted activities, picnic meals, swimming, baseball, and even an afternoon discussion period. For every consecutive year, camp staff has programmed a ‘summer special’ – evolving over the decades into a ‘family weekend’ with a reputation renowned for the best beef barbecue around! The third and final camp of the first summer season was conducted after Visitors’ Day, and when it was over the time for evaluation had come. The Federation decided it had made the right move. Development prospects for the property looked good. Campers appeared to have been content, but it was recognized that enlarged facilities would soon be a necessity. In the early days of youth programming there was little doubt in the minds of those planning folk school and camp agendas as to what the theme of the program should be. Any emancipation which had come to rural people had flowed essentially from two channels – from seeking legislation to improve the agricultural condition, and from the establishment of local co-operatives. And so the ‘curriculum’ was to teach training and experience in public speaking, conduct of meetings, parliamentary procedures, leadership of discussion groups, preparation and presentation of recreational programs. A second area of study and discussion was farm organization and the rural community. 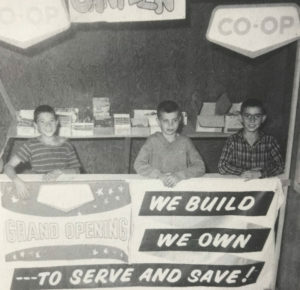 Co-op store operated by campers. At all camps a co-operative ‘treat-bar’ or a credit union was organized. Campers met in full session to discuss the proposal, to elect their board of directors, and to select members for any committees required to run the business efficiently. Those who wishing to become members of the ‘co-op store’ paid a membership fee and deposited what ‘shares’ they wished for the purchase of supplies. The treat-bar opened for a limited time each day under a manager and staff ‘hired’ by the members. At the end of the week membership met to hear a report of the operation. Fees and shares were returned to the members, along with any ‘dividend’ which they had earned through their patronage of the business. Thus did the children learn of the productivity and power of self-help organizations. In 1951, some additional property was obtained, bringing the site to 9.4 acres. In 1952, four single unit, wooden frame, square cabins with grey siding and red asphalt shingles were constructed. The labour involved was all voluntary. Each of these comfortable new cabins was large enough to house 14-16 campers in two rows of double bunks. The cabins were named Ransom, Kagawa, Rochdale, and Coady. The same year, a foundation was laid for the construction of a large recreation hall or pavilion. The pavilion, built with a large open area under arched beams, and a two-storey rectangular front area, began to take shape in 1953, thanks to thousands of hours of voluntary labour provided by many dedicated young people. This new recreation facility, which continued to be developed over several years, eventually offered a hardwood floor suitable for dances and indoor games; a staff room and office; an upstairs meeting room, a second small meeting room, and a stage. 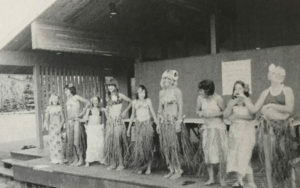 The pavilion also housed a large brick fireplace around which many enjoyable programs and sing songs have taken place. 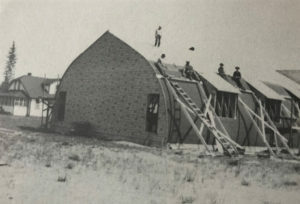 Pavilion takes shape – 1953. In 1954, the remainder of the “Crawford” quarter section of land, adjoining the original site, became available, and was purchased by the M.F.A.C. Development of the site remained relatively static until 1962, when a staff lodge containing five bedrooms, each with two single beds; areas for male and female bathrooms, and a bright and comfortable staff lounge were built on the crest of the hill to the northwest. In any new buildings constructed from this time on, increased attention was directed to having them blend somewhat more into the natural surrounding area, using wooden siding and natural oil stains. In 1963, a new double unit cabin (room for 14-16 campers in either end, with counsellors quarters between) was constructed on the side of the hill to the northwest of Kagawa. 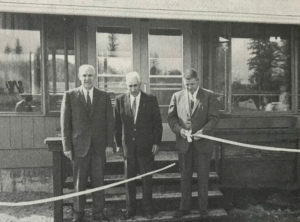 Grand opening of new Dining Hall facility – 1965. With the establishment of the Wasagaming Foundation in 1964, a master development plan for the Centre site was developed. It was envisaged that the Centre would be developed to the point that organizations with ready access to funding could be attracted to use the facility for meetings, conferences, retreats, etc. In turn, these rental funds would allow camping and outdoor education experiences for young people to be offered at a somewhat subsidized rates. Phase I of the plan called for the construction of a new dining hall facility, with an up-to-date institutional kitchen, and modern washroom facilities. 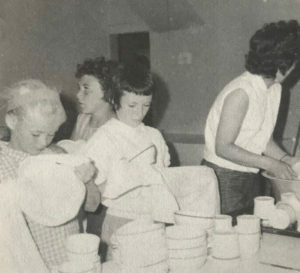 The challenge was undertaken and completed in time for a beautiful new dining hall to be officially opened at Family Camp on the August long weekend of 1965. It boasted an open, spacious dining area designed to serve approximately 100 people. The modern new kitchen included both a walk-in refrigerator and freezer, with a large institutional gas range and grill. A pantry and staff bathroom, which doubled as a nursing and first aid centre, were included in the new facility. The new hall also incorporated an outdoor stage on the north end, with natural seating provided by the slope of the hill. During the spring of 1972, the obtaining of a Local Initiative Grant, under the federal Department of Manpower and Immigration, sparked a flurry of developmental activity on the Centre site. Two additional double-unit cabins were constructed. The Canada Works project also included the construction of a modern two bedroom home for an on-site caretaker, and a large double garage and workshop on the property. Rochdale, Kagawa, and Ransom cabins were re-located in the field over the north hill and became known to more recent staff as the “greys”. Out of concern about the fluctuating fortunes of farm organizations in Manitoba, a number of far-sighted and dedicated farm leaders agreed that steps should be taken to more adequately ensure the permanency of the camping facility. The new Wasagaming Foundation, a non-profit, educational corporation was established in 1964. The physical assets of the M.F.A.C. camp were transferred to the new Foundation, legally separating the site and the program which was carried out on it. 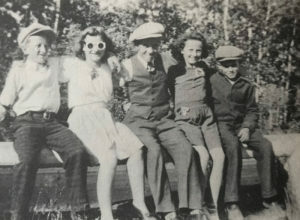 The site was renamed Riding Mountain Conference Centre while the summer camp program carried the name Camp Wannakumbac. It wasn’t until 1987 that responsibility for the Camp Wannakumbac program was assumed by the Wasagaming Foundation… camp program and campsite were legally married again! The Camp Wannakumbac program, of course, has always been the Conference Centre’s largest customer, having had, essentially, a standing reservation each year for the months of July and August. The Centre’s buildings have all been winterized, allowing the facility to operate on a year round basis, playing host to schools for outdoor education programs and other groups for meetings, seminars, and retreats. To provide an experience in group living, encouraging the development of each individual camper’s interests. To provide recreation opportunities with emphasis on those in which the camper may not have the chance to participate at other times. To provide as many opportunities as possible for the learning of new skills and for leadership training. Perhaps the very simple statement of purpose coined by a teen camper in the 1970s expresses the goal of Camp Wannakumbac more eloquently than any other: FUN!, FRIENDS!, and LEARNING!